Fawkner Rally: Duplicate the Line Now! From the youngest speaker to the oldest the ask was made very clear at a rally in Fawkner on Saturday: duplicate the Upfield line, improve public transport for the North. 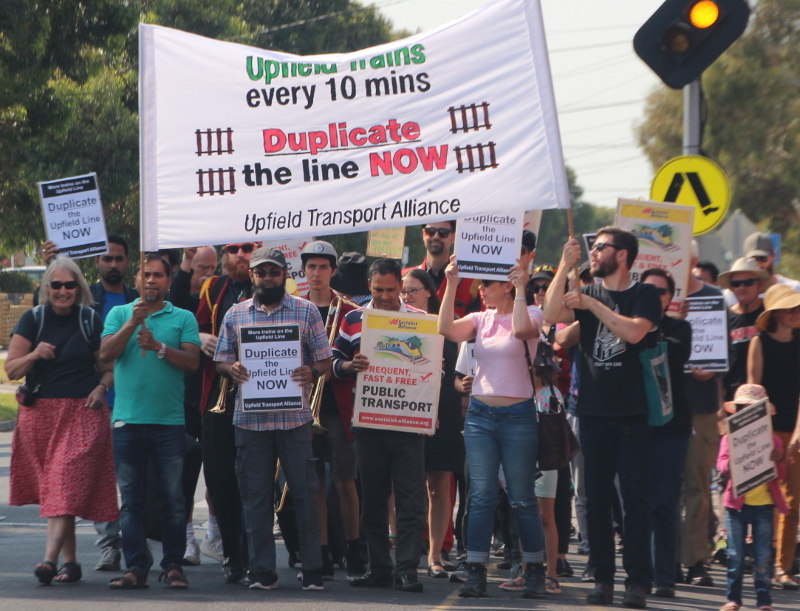 “It’s the community who benefits from the duplication of the Upfield line and the community who will win the campaign to duplicate it now.” The Upfield Transport Alliance says. The Riff Raff Marching Band performing at the Fawkner rally: We need more trains on the Upfield Line. The Upfield train line in Melbourne’s north continues to languish with an insipid 20 minute train service, with passengers on the northern stations being further put out when anything goes wrong with trains being short shunted at Coburg Station. The Government’s rail network plan shows that track duplication, upgrade and extension of the line to Craigieburn is in the works but not for 15 years or so. Meanwhile, urban consolidation and property development in Brunswick and Coburg, and in Hume suburbs such as Campbellfield and Coolaroo, and further out past Craigieburn at Mickleham and Wallan, means there is increasing demand and need for provision of a more frequent and reliable service on the Upfield line. “It’s a matter of social equity that upgrade of the Upfield line is given a much higher priority by the Dan Andrews Labor Government.” said sustainable transport campaigner and Fawkner resident John Englart. A number of speakers gave their perspective on the need for track duplication and upgrade of the Upfield line. Anyone who works in the city really feels the pain of cancelled service on the Upfield train line. The frequency and reliability is one of the worst on the metropolitan rail network, and it has consequences for people getting to work on time and for meeting appointments. Abdul articulated the agile methodology and it’s use in programming, but the inconsistency of Upfield service often means getting to work late and missing participating in stand-up meetings with colleagues. If you look at health outcomes upgrading the Upfield line is proportionally far more important for residents in lower socio-economic suburbs of northern Moreland and Hume, and a matter of social equity, says Brunswick resident Maureen Murphy, arising from her recent PhD research. Pauline Galvin, a Coburg resident and member of Climate Action Moreland, highlighted the importance of track duplication and upgrade of the Upfield train line to enhance mode shift to more sustainable transport and reduce transport climate emissions. Currently transport emissions are rising. We have a climate emergency, the students want action on climate change, and that must also mean improving the public transport infrastructure to enable mode shift. Joe Perri from Fawkner Residents Association quoted statistics and population projections at the Fawkner Rally to Upgrade Upfield line. “From 2011 to 2036 the population of Moreland will increase by 74,000 or 48 percent and most of that growth will be along Sydney Road and the Upfield line….we can’t wait 15 years to fix the public transport mess.” said Joe Perri. Coolaroo resident Sheridan Tate told the people gathered after marching to Gowrie Station: “we don’t have a public transport that delivers…the north is really neglected”. Sheridan Tate briefly highlighted the problems for residents in Hume who use the Upfield train Line, and the neglect by succeeding state government of adequate public transport infrastructure, highlighting this as a social equity issue that even a Labor state Government is failing to address. Brunswick Greens MP Tim Read (Facebook) addressed the Fawkner Rally at Gowrie Station “We’ve got to fix the system” he said. He pointed up the line to where it becomes single track all the way to Upfield Station about 4 kilometres away. Tim Read told the crowd that improving public transport was a high priority during his election campaign and a priority he will focus on. He has a meeting with the Minister for Transport in the comes weeks. He articulated the many reasons to move people out of cars to public transport and sustainable transport modes, in reducing pollution, reducing congestion, reducing transport emissions in addressing climate action, and for addressing social equity. The other state MP’s that cover the Upfield line: Lizzie Blandthorn (Facebook) for the Pascoe Vale electorate, and Frank McGuire (Facebook) for the Broadmeadows electorate, had also been contacted to attend to show their support for this community campaign. Moreland Councillor Sue Bolton presents 4 anecdotes from people she has met while leafletting stations highlighting the problem and need for upgrading the Upfield train line. She articulated that the Mernda community were united and succedded in increasing the priority for the Mernda extension, and that we need to remain united from Royal Park to Craigieburn to win this campaign for the duplication and upgrade of the Upfield line to be brought forward. Moreland’s Deupty Mayor Councillor Mark Riley was also in attendance. Mayor of Moreland Cr Natalie Abboud gave her apologies but had other community commitments to attend to. Posted on March 18, 2019 March 18, 2019 by John EnglartPosted in events, newsTagged Fawkner, march, protest, rally.